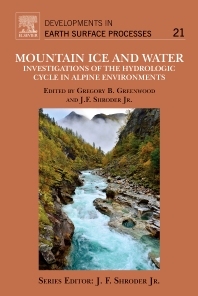 Mountain Ice and Water: Investigations of the Hydrologic Cycle in Alpine Environments is a new volume of papers reviewed and edited by John Shroder, Emeritus Professor of Geography and Geology at the University of Nebraska at Omaha, USA, and Greg Greenwood, Director of the Mountain Research Initiative from Bern, Switzerland. Chapters in this book were derived from research papers that were delivered at the Perth III Conference on Mountains of our Future Earth in Scotland in October 2015. The conference was established to help develop the knowledge necessary to respond effectively to the risks and opportunities of global environmental change and to support transformations toward global sustainability in the coming decades. To this end, the conference and book have investigated the future situation in mountains from three points of view. (1) Dynamic Planet: Observing, explaining, understanding, and projecting Earth, environmental, and societal system trends, drivers, and processes and their interactions to anticipate global thresholds and risks, (2) Global Sustainable Development: Increasing knowledge for sustainable, secure, and fair stewardship of biodiversity, food, water, health, energy, materials, and other ecosystem services, and (3) Transformations towards Sustainability: Understanding transformation processes and options, assessing how these relate to human values, emerging technologies and social and economic development pathways, and evaluating strategies for governing and managing the global environment across sectors and scales. Since 2004, Dr. Greenwood has been Executive Director of the Mountain Research Initiative (MRI), an international project office funded by the Swiss National Science Foundation and focused on global change research in mountains worldwide. Prior to MRI, he served as Science Advisor to the Resources Secretary of California and Climate and Bioenergy Advisor for the California Department of Forestry. He has a Ph.D. in Ecology from the University of California at Davis, an M.S. in Range Science from Colorado State University and a B.A. in Geography from Middlebury College. He counts his time at the State of California as his post-doc in political reality. He is familiar with the Northern Appalachians, the Colorado Rockies, the Sierra Nevada and Cascades, the Swiss Alps, the Highlands of Western Cameroon, and selected portions of Tibet, the Karakorum and the Himalaya.